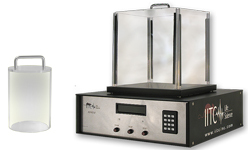 The IITC Hot Plate Analgesia test is used for latency testing in rats and mice. The animals are placed on a black anodized, aluminum plate (11” X 10.5” X ¾”, 275mm X 263mm X 15mm) which is heated uniformly. Set point temperature in Celsius. The plate’s surface temperature can be adjusted from ambient up to 75 degrees Celsius. Plate has consistent temperature throughout providing accurate tests. All systems are supplied with both a mouse and rat enclosure allowing testing of both animals standard. If needed IITC allows purchase of each enclosure separately. Holding accuracy is +/- 0.1 deg c.
Electronics - 18" X 18"